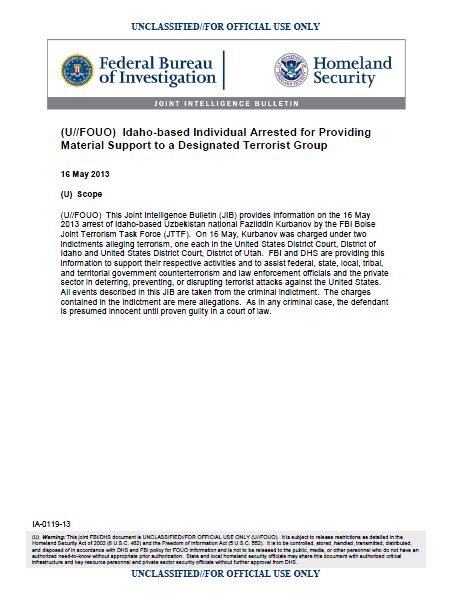 (U//FOUO) This Joint Intelligence Bulletin (JIB) provides information on the 16 May 2013 arrest of Idaho-based Uzbekistan national Fazliddin Kurbanov by the FBI Boise Joint Terrorism Task Force (JTTF). On 16 May, Kurbanov was charged under two indictments alleging terrorism, one each in the United States District Court, District of Idaho and United States District Court, District of Utah. FBI and DHS are providing this information to support their respective activities and to assist federal, state, local, tribal, and territorial government counterterrorism and law enforcement officials and the private sector in deterring, preventing, or disrupting terrorist attacks against the United States. All events described in this JIB are taken from the criminal indictment. The charges contained in the indictment are mere allegations. As in any criminal case, the defendant is presumed innocent until proven guilty in a court of law. (U//FOUO) Fazliddin Kurbanov was arrested on 16 May 2013 by the FBI JTTF in Boise, Idaho, and charged in the District of Idaho with one count of conspiracy to provide “material support and resources” to terrorists, as those terms are defined in 18 U.S.C. Section 2339A; one count of conspiracy to provide “material support and resources” to a Designated Terrorist Organization, as those terms are defined in 18 U.S.C. Section 2339B; and one count of possession of an unregistered explosive/firearm, as those terms are defined in 26 U.S.C. Section 5861(d). Additionally, Kurbanov was charged in the District of Utah with one count of distribution of information relating to explosives, destructive devices, and weapons of mass destruction, as those terms are defined in 18 U.S.C. Section 842(p)(2)(A). — (U//FOUO) The District of Idaho indictment alleges that from in or about August 2012 through May 2013, Fazliddin Kurbanov knowingly and intentionally conspired with co-conspirators to provide material support and resources to the Islamic Movement of Uzbekistan (IMU), a designated terrorist group. — (U//FOUO) The District of Idaho indictment alleges that Fazliddin Kurbanov conspired to provide personnel, computer software, and money to the IMU, knowing that the IMU has engaged in terrorist activity and terrorism. — (U//FOUO) The District of Idaho indictment alleges that on or about 15 November 2012, Fazliddin Kurbanov knowingly possessed a firearm not registered to him in the National Firearms Registration and Transfer Record. — (U//FOUO) The District of Utah indictment alleges that from 14 January to 24 January 2013, Fazliddin Kurbanov knowingly taught and demonstrated the making and use of an explosive with the intent that the teaching, demonstration, and information be used for violent activity. Kurbanov showed Internet videos, provided written recipes and verbal instructions, and conducted instructional shopping trips which informed as to the construction and use of an improvised explosive device (IED). (U//FOUO) Fazliddin Kurbanov’s alleged conspiracy highlights the continued presence of US-based individuals who maintain interest in conducting homeland-based attacks. FBI and DHS encourage federal, state, local, tribal, and territorial counterterrorism officials to remain alert and immediately report suspicious activity and potential behavioral indicators of pre-operational terrorism planning activities, to include acquisition of materials and construction of explosive devices. Some of these behavioral indicators may be constitutionally protected activities and should be supported by additional facts to justify increased suspicion. No single behavioral indicator should be the sole basis for law enforcement action. The totality of behavioral indicators and other relevant circumstances should be evaluated when considering any law enforcement response or action. — (U//FOUO) Suspicious activities in storage facilities or other areas that could be used to construct an explosive device.